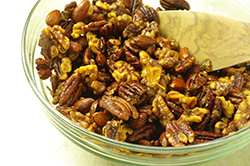 These nuts, adapted from a recipe in The Union Square Café Cookbook, are addictive. The nuts are toasted and then coated with a mixture of cayenne pepper, herbs, and brown sugar. It’s best to serve these warm for maximum flavor. Offer them with drinks and watch them disappear. 1. Preheat the oven to 350°F. 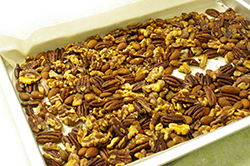 Spread out the nuts on a baking sheet and toast until golden brown, about 10 minutes. 2. 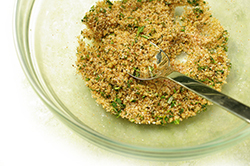 In a large bowl, combine the remaining ingredients. With a big wooden spoon, stir the nuts in the herb mixture, making sure the butter melts and moving the nuts around so they are evenly coated. 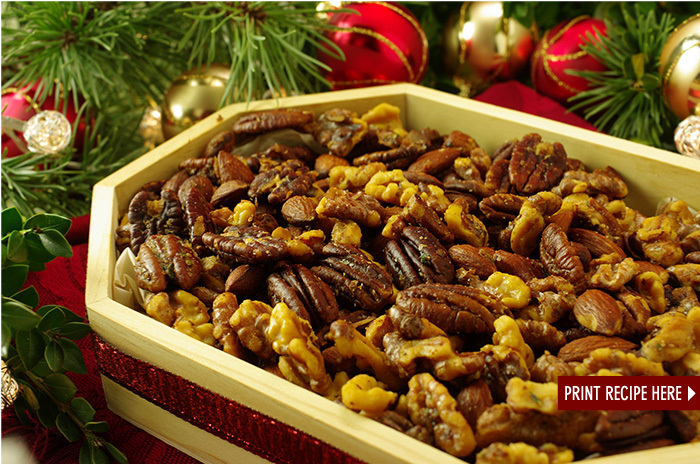 Transfer to a pretty bowl and let sit for 5 minutes to crisp the nuts before serving. The Clever Cook Could . . .
Slice some seasonal fruit and arrange on a platter. 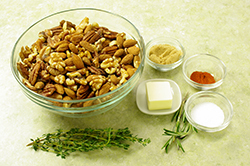 Place a mound of the nuts in the center for a super-easy after-dinner or lunch treat.